May 27, 2012 - U.S. Customs and Border Protection officers at John F. Kennedy International Airport seized more than $200,000 in counterfeit 100 dollar bills in two separate seizures. During the inspection of her suitcases, CBP officers discovered that the bottom of the bag was unusually thick. CBP officers removed the lining of the luggage and discovered flat rectangular packages containing counterfeit U.S. currency. On May 6th, CBP officers seized $68,000 in counterfeit $100 U.S. bills from Peru arriving at the JFK International Mail Facility. The counterfeit currency was found by CBP officers concealed in file folders and childrens' books. The investigation is ongoing and no arrests have been made. On May 8th, CBP officers inspected Ms. Katherine Velez, who had arrived at JFK from Cali, Colombia. During the inspection of her suitcases, CBP officers discovered that the bottom of the bag was unusually thick. 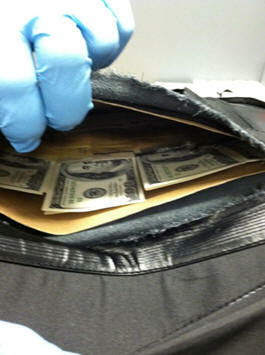 CBP officers removed the lining of the luggage and discovered the counterfeit U.S. currency. Ms. Velez was placed under arrest and a total of $141,200 of counterfeit U.S. currency was seized. She will be prosecuted by the U.S. Attorney?s Office in the U.S. Eastern District Court of New York. ?The responsibilities of a CBP officer are vast,? said Robert E. Perez, Director of CBP?s New York Field Operations. ?Despite the multi-faceted challenge our officers encounter everyday, they are ever vigilant in their efforts to protect the United States. These seizures speak to the diverse CBP mission.? ?Partnerships, as we have with CBP at JFK, are essential in preventing counterfeit currency from entering the United States,? said John McQuade, Resident Agent in Charge of the Secret Service?s JFK office. ?Cooperation among agencies at JFK, and throughout New York, has allowed us to focus our resources and respond quickly to uncover and prevent counterfeiting and other criminal activity. ?